This workshop is being run by Mel an expert in Gruffalo Hunting! Find the secret path, discover the storytelling circle. 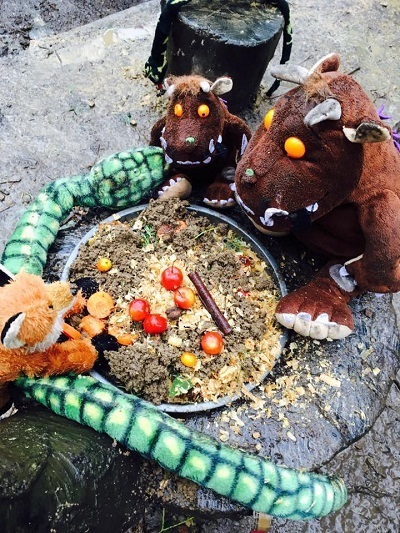 Come and share an adventure in the wilderness, reading the story of the Gruffalo and letting the children get involved, helping with the voices of the animals and actions to suit! This activity is about the adventure, we go in search of the Gruffalo and although this is the end goal its more about what happens along the way. Learning how to get camouflaged, searching for clues and characters from the story. We will weave in and out of fantasy, finding habitat homes and seeing what’s really going on in the wood too! It’s an active exploring session and the children enjoy recognizing the animals hiding in the woods. We will make our own Gruffalo clay creations. Age: For all the family 2 year + – Accompany adult Free!